The New York City Marathon was and will always be that one marathon you remember for life. 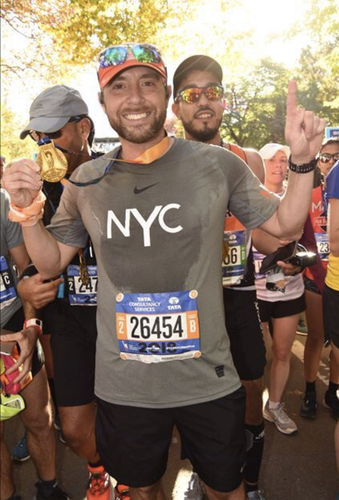 This was my bucket list race, as NYC is where my running journey began three years ago. I traveled to New York on Friday, a short drive from Ohio, checked into my hotel which happened to be just footsteps from the Queensboro Bridge and then headed directly to the Expo. The Expo: Massive is a word that perfectly describes it. The expo is held in the Javetis Center and is open to the public. Bib pickup was fairly simple, as long as you had a photo ID and your race confirmation sheet. If you did not have the confirmation sheet there was an area to print these off. I think I had my bib within 5 minutes from arriving at the expo. Next stop was race shirt pick up. They did have an area for you to try on a sample shirt for size selection, but no thank you way too many germs. The Expo had quite a few vendors, areas for runners to take pre pictures, and a huge New Balance store with TCS NYC Marathon gear. Overall I felt that the expo was spacious enough, easy to navigate, and not overly crowded. It was a great place to meet up with other BibRavePro’s who were running as well. Swag: Race shirt - just your average long sleeved race shirt. I actually thought the material would be better quality, however when you have to appeal to the masses it’s a hard thing to do. Race Management: For hosting over 53,000 runners I have to say NYRR nailed it. Yes there probably are things that could be improved, however if those areas were changed it wouldn’t be the NYC marathon vibe and feel. Registration was easy! There are four ways to receive entry: lottery, time qualifier, charity, or the 9 + 1 option. Communication was often leading up to the race and picked up to daily the final week. Transportation to the race was challenging, I opted for the Staten Island Ferry, which required a subway ride from Queens to the Staten Island Ferry, a boat ride to Staten Island, then a bus ride to Fort Wadsworth which hosts the start village. This is important - MAKE SURE YOU GIVE YOURSELF ENOUGH TIME! The Course: As mentioned you start the race on Staten Island. The race village is pretty awesome as there are runners everywhere and it almost has that Woodstock vibe. More than enough port-a-toilets for the 53,000 runners that I don’t think I waited more than 5-10 minutes. At the village they have free breakfast consisting of bagels, bananas, coffee, water, protein bars and Gatorade energy gels. Fuel up before the race. For those who selected bag check over the poncho, bag check was done here. UPS would shuttle your items to the finish line. For me the course was absolutely amazing. There were four waves separated by corral and color. You start the race on the Verrazano Bridge so as you can expect your 1st Mile is a gradual incline to the highest point in the course. Great views of downtown New York. The 2nd Mile was straight downhill so controlling your pace was even more crucial. For the next 8 miles you traversed the streets of Brooklyn and let me tell you oh the crowds. Wow the energy was amazing. Aid station every mile consisting of Gatorade endurance drink followed by water. Soon you entered Queens for 2 miles before heading back in Manhattan over the Queensboro Bridge. Take it easy over this bridge as you tend to forget your 15 miles in. As you exit the bridge you will be welcomed by some of the craziest crowds I’ve ever seen. The remainder of the race felt like rolling hills all the way to the finish. Crossing into The Bronx had me looking for the lady with the “This is the last damn bridge” sign. From there I knew it was straight up 5th Avenue to Central Park! A route I’ve run many times. The scenery along the course was great and allowed runners to experience each of the five Burroughs. The only time I had peace and quiet were those bridges! The finish was probably where I would like to see change. After running 26.2 miles, the last thing I want to do is have to walk another mile to obtain my checked baggage. It took me a good 30 minutes to have a few pictures taken, pick up my post race snacks and checked baggage then finally exit Central Park. Luckily each runner was given a heat shield because it was a little cool walking through the shaded areas of Central Park. On a closing note this was by far my most memorable marathon. Should you run this race??? Hell yeah and if you don’t I’ll take your lottery entry because I know I want to do it again!!!! 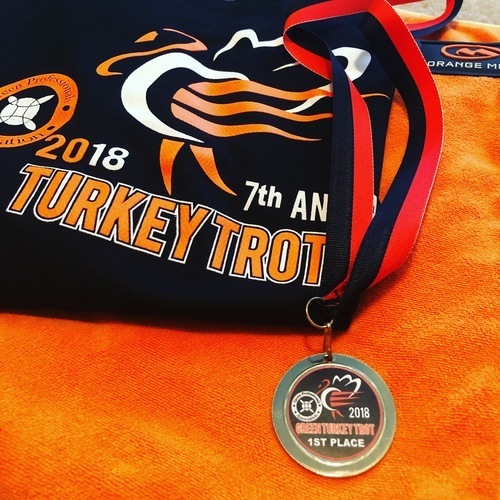 "A Turkey Trot - A Holiday Tradition"
This was my first time running the GTA Turkey Trot 5k and for the most part had a great time. The race supports providing Green High School students with scholarships and have given over $37,000 the past 7 years. The race is held on Thanksgiving and provides two race distances (1-mile and 5k). The races start at 7:30 (1-mile) and 8:00 (5k). There is not an expo and packet pickup takes place the day before 4pm - 8pm or on Race morning. This year everyone who picked up their packet received a free 2 day pass to the Cleveland Clinic Green Fitness Center. Swag: consists of a long sleeve tech race shirt. No medals are awarded for completing the race, unless you finish top 3 of your age group. After the race they have water, snacks and music playing for those brave enough to endure the cold and stick around for the award ceremony. Parking: Parking is literally steps from the start line so allows you to stay warm in your vehicle! Win! Race Management: This is not a chipped time event so there is extra waiting after the event for the results to be posted. Well I as always arrived extremely early and ended up spending 45 minutes waiting in my warm vehicle. Thank goodness for the close parking. I’ve always wanted to run this Turkey Trot and signed up this year. It’s a great way to support and give back to the students of Green. The race is limited to 600 participants and they sell out every year. The race starts at the Professional Administration Building and heads up to a main road then back through and around the various Green Schools and finishes on the high school track. A very easy course with minimal elevation increases. I started out fast in hopes of a PR and placing in my age group. I’ve been working on speed and this allowed me to evaluate the work I’ve been putting in. The race start was congested but opened up within the first 400 meters. I got into a good rhythm and continued to push hard. At the end I kicked it in gear and finished with not only a PR, but a 1st place in my age group. Likes: Small race, great parking location, supports community schools and donations. Quality race shirt. Dislikes: Lack of Medals -While not a huge importance to some, but others experiencing their first race might dislike. Would be great to announce on registration page. Allow runners with dogs. One almost tripped me with their leash. Non-timing chip race. Overall: I will run this race again as it is my hometown race. Great support to the community and provides scholarships for students. "All About the Chocolate & Running - Hot Chocolate 15k Columbus, OH"
Registration for the Hot Chocolate Series, put on by RAM Racing, opens up early in the year. The prices for the 15k/5k are relatively inexpensive compared to other races. Early registration starts off at $69 and increases to $79 closer to race day. During registration you can also make a donation to The Make A Wish Foundation, which is the race partner charity. Not a better charity out there to support and hats off to the partnership between the race organizers and charity. Additionally you have the option of paying extra to have your race packet including (bib & race swag) to your home address. The festivities kickoff at the two day race Expo, which was held at the Greater Columbus Convention Center. There were about 20-30 vendors offering race gear, local races and charities that you could purchase gear from and visit. Due to my travel week I was unable to make it to the Expo, so took full advantage of having my race packet shipped to my house. From what I heard from participants at the race that did have the opportunity to visit the Expo, their opinions were positive on packet pick-up, the vendors and overall atmosphere. They did also mention there was CHOCOLATE to be consumed, which if you haven't heard is a staple/theme of the race. Note: Due to volume of race participants there was no race day packet pick-up. I was looking forward to race day during the leading weeks. I felt I had put in the necessary training to hit, if not surpass my goal. The night before the race, my wife asked if I checked the weather?!?!?!?! I am one that tends to not pay to much attention, but decided to look at the forecast called for 70% chance of rain and temperatures in the upper 60's. Wait this is November, right? I was driving in from Akron so the alarm went of early and I made the drive to Columbus. I arrived around 6am and traffic was actually pretty light. Prior to race day, in the weekly email, it was recommended to reserve parking ahead of time, due to the fact that 10,000+ runners would be participating. I did just that, but had a difficult time getting to parking structure I selected based on road closures. Eventually after some back roads navigating I found the parking structure and was pleasantly surprised to find it located right next to the post-race party! I passed through where the post race party would be and found that it was very organized. I am not one to participate in gear check, but definitely made sure I checked it out and needless to say there were several volunteers checking in bags and areas were separated by bib number. Easy in and easy out. In that area you could find information and volunteers assisting racers with navigation questions, additional safety pins. Off to the start line which was a 500meter walk from the post race after party. With the number of runners participating, each runner had a corral letter on your bib. There were plenty of restrooms available near the start line, and I did not see any lines. I made my way into the corral at 7:00am for the 7:30am start. The race director was engaging with participants and right before the National Anthem a few children from the Make a Wish Foundation told the crowd their stories and how the Make-A-Wish Foundation made their wishes come true. Pretty touching and even more of a reason to run this race. The National Anthem was sung and the race started. Each Corral was spaced out to not congest the streets of Columbus, so I made my way out from the starting gates. It was getting a little warm at the time, but with the overcast it wasn't too bad. I positioned myself in between the 7:00 min and 7:30 min pacer. The beginning of the race was through the streets of Columbus, where I expected to see more spectators than were out. I blamed that on the weather, however there still were cheers to be heard. The course is pretty flat with only 230 ft of elevation gain from start to finish. Although for me it felt that elevation change was more drawn out than sudden. Downtown Columbus was just that, big buildings, not to much to see. Around mile 4 you headed onto the campus of Ohio State where you passed the basketball arena and headed over the Olentangy River. This is where the spectators diminished to few if any and the course became peaceful. At mile 7 you headed through a residential area and back towards the finish line. The crowd presence was much greater here providing that extra jolt of energy to cruise to the finish line. There was a race announcer calling out names of each finisher, but I was to focused on hitting my PR to hear my name called. After you finished you were handed your finisher medal, nuun drink, a bottle of water and had the opportunity to take a picture. There were no food items immediately past the finish line. I felt the aid stations needed a section of their own in this review. This race isn't called America's Sweetest Race for nothing. As you approached the aid stations I was expecting water or Nuun to be the first cup, however at the first station I grabbed a cup only to find M&M's. What chocolate at an aid station? LOL, well I took that cup and moved on to water and my favorite beverage Nuun! There were plenty of volunteers staffing each station and more than enough beverages to be passed out. Each aid stations had a different snack. The post race party was by far the best that I have been to. It was held very close to the finish line where you would find your Chocolate!!! Each participant received a cup of hot chocolate, marshmallows, pretzels, banana and chocolate fondue to dip your food into. Talk about a race having 500 gallons of hot chocolate and over 1200lbs of chocolate fondue. Yummy! There was music playing, several selfie opportunities with inflatable marshmallows. What I also found pretty awesome was the Make-A-Wish Foundation where you could have your bib scanned and donate $10 to make wishes come true. I definitely took advantage of that. All in all outside of real food being offered I enjoyed the chocolate. The swag is by far the best I've received from a race. The 1/4" pullover colors for both the men and women participants is great. (Blue - for Men, Purple - for women). The medal for the race is modeled after a huge chocolate bar. This year the race added a key chain for each city as an extra. Pretty cool if you ask me. All in all this was my first Hot Chocolate 15k and I wouldn't be surprised if you see me at another in the future. The race communication was excellent, the post race party SWEET, no pun intended and the swag fantastic. Do yourself and register for a Hot Chocolate 15k/5k!!! "International x2 - Running the D"
Have you ever wanted to run across International borders during a race? Well the Detroit Free Press Marathon cross the border not once, but twice. Did I mention that one of those border crossings just happens to be through a tunnel under the Detroit River? This year the 40th running of the Detroit Free Press took place on Sunday, October 15th, 2017 at 7:00am. More than 26,000 runners would be participating in the International Marathon, the Marathon Relay, International Half-Marathon, and the US Only Half-Marathon. Wow, talk about a showing. For my race review I will break out each area that I feel runners should know about the race going in. This will allow for a basis to determine whether the race is for them or not. Pricing & Registration⭐️⭐️⭐️⭐️: Pricing for the Marathon was in line with other marathons that I’ve run in the past. Increases are spaced out over the months from when registration opens up until registration closes. Note that since the marathon crosses the U.S./Canada border, you will need a valid Western Hemisphere Travel Initiative (“WHTI”) compliant document such as a passport, passport card, enhanced driver’s license (“EDL”), trusted traveler program card (NEXUS card) or U.S. Lawful Permanent Resident card. All entries are reviewed by government agencies prior to the race and yes you must run with the above during the race. Don’t think of the above as a pain think of it as having celebrity status! Communication⭐️⭐️⭐️⭐️⭐️: The communication and social engagement by the race crew was awesome. They remained engage starting early on via all social media outlets (Facebook, Instagram and Twitter) answering questions, sneak peaks, and countdown information. This was exceptionally key day before the race when the weather outlook was ominous. Hands down awesome and takes an army to accomplish, yet they are so much smaller. Expo ⭐️⭐️⭐️⭐️: The race expo was held in the Cobo Convention Center in Detroit. The expo opened Friday afternoon and once again on Saturday morning. There was no race day packet pick up due to above mention items. Packet pick up was easy if you followed directions, then again even if you didn’t it was that difficult. The race sent out a link to look up your bib number, which was requested from the volunteers at pick up. If you didn’t heed the warning luckily there was a computer onsite where you could complete this step. Hopefully you remember your WHTI document as it was required. All in all this process was easy. You received a bag with your swag and bib. Vendors were plentifully where you could purchase official race gear and anything running you could think off. Overall the Expo was on par for expos I’ve seen in the best. Swag⭐️⭐️⭐️⭐️: Who doesn’t like swag? I know I look forward to it. Inside my swag bag was a New Balance long sleeved tech shirt, Bib, bandana with The Free Press logo on, a 26.2 Free Press marathon sticker, and a official race program. The finisher medal for all sweet!!! Cool thing that participants were able to vote on what was featured on the medal. I selected the corvette and was I surprised to see that was part of the final product! Course⭐️⭐️⭐️: Don’t let the three stars deceive you as that is focused on the difficulty and not scenery or the awesomeness of Detroit. Not a lot of elevation outside of crossing the Ambassador Bridge or coming back through the Detroit-Windsor Tunnel. I did say you cross the International border twice right? Well the Free Press Marathon is the only race in the world that does this TWICE, along with adding in the fact it is the only underwater mile. Through the race you will run on pavement and occasional brick roads through Indian Village and on to Belle Isle while finishing up the last miles along the Riverwalk. For the most part the roads are in good condition, but you will see a few areas that could be troublesome if you aren’t paying attention. Crowd participation can be found throughout the course, minus a few areas. What was interesting about this course was having to run through the border twice, as border patrol and custom agents were in high numbers checking for bib numbers and anyone carrying excessive liquids through those crossings. If you paid attention to directions traversing through these areas was relatively easy. Aid Stations⭐️⭐️⭐️: Numerous is all can say. Aid stations could be found every two miles through the first half of the course offering Absopure H2O and Lemon Lime Gatorade. They lined each side of the street and were staffed by awesome volunteers. At times the stations were congested and it was difficult fining your drink of choice. After around midway the aid stations increased to every mile. Cliff shots were offered along the course consisting of Strawberry, Citrus and other flavors. There were other areas where oranges, bananas and other beverages were being handed out by spectators. After Party⭐️⭐️⭐️: The after party was open for race participants and families. The location was a few blocks away from the finish line where additional food items, beverages, massages and race gear could be found. When you finished the race you were handed your medal, water or Gatorade and a bag of goodies for refueling. A much needed heat sheet was provided to all runners. Unfortunately I was not able to attend the after party due to a stop at the medical tent. Parking⭐️⭐️⭐️: Several parking options were available in the downtown area. Race communication was sent out to use SpotHero to book your spot ahead of time. This saved time in the long run. Traffic going into Detroit wasn’t too bad, but there is quite a bit off construction downtown. I arrived early and had no issues making it to the start line well ahead of schedule. Overall I would recommend this race to anyone looking for an October race. Great course, exceptional race volunteers and superb communication. 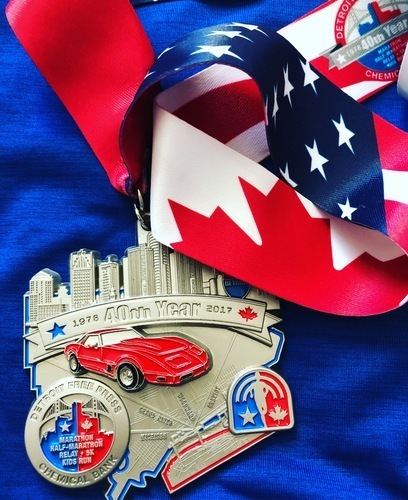 If you want to see Detroit and Windsor all in one day this race is for you. Heading into the Detroit Free Press Marathon to say I was excited would be an understatement. Growing up in Michigan for a good part of my life and going to college in downtown Detroit made this one special for me. Add running this as a BibRave Ambassador felt like having my cake and eating it too! Going into the race I was targeting a goal time or PR based on my overall preparation. I ran into injuries and a new job that impacted my training. This race was all for fun! About two weeks prior to race weekend all the BibRave Pros received an email from the race team offering a “Behind the scene” VIP tour. Talk about sweet!!! So I headed up to the D on Saturday morning to arrive just prior to meeting up for the tour. I arrived at Cobo and found a parking spot, where we received a discount from the $15 parking fee. The Expo was hopping with excitement. Always great to see on race weekend. I picked up my packet without issues and met up with fellow BibRave Pros (Dane, Angie, Nicole, Josh and Jeph). Shortly thereafter Leah from the Free Press Marathon Crew directed us to where everyone, including the Free Press Marathon Ambassadors, was meeting up. We were handed an extra swag bag and off we went on the tour. We got to see where volunteers packed all the swag bags then headed outside to the start and finish line. Along the way we passed several cadets that volunteered packing up all the food finished bags. Talk about taking their jobs seriously while having fun doing it. The start and finish lines were being constructed which allowed for several photo opportunities and behind the ropes areas most are not privy too. To end the tour we headed up to marathon headquarters and to where all the pre race magic happens. Cool stuff and really appreciated the open arms during the tour! Next day I woke up to rain and severe wind. Weather reports were calling for 70 degree temperatures and 30 mph wind gusts at race start with possible thunderstorms shortly thereafter. I headed up to the race hoping for the best and met up with the BibRave Crew once again. We said our good lucks, snapped a few pictures and looked for the numerous port-a-potties! Lines were long as usual on race morning. Entrance to the corrals was a bit difficult as you entered from the sides. Each bib had a corral letter, but I didn’t see anyone checking at the corrals. We piled in and the Canadian & American Anthems were sung and it was race times! Each wave were separated by 2 minutes to prevent on congestion during those early miles and ultimately to allow for bridge crossing. I felt great in those early miles, although the humidity was getting to me. At mile 3 we entered the first border crossing and throngs of border/custom agents we large weapons. As mentioned earlier communication was sent out that your bib should be placed chest high, for easy identification by the agents. I saw one guy with his bib on his back get stopped. Sorry for him. Crossing the Ambassador Bridge was amazing as the sun was rising. As soon as I got over the bridge I needed to stop for a bathroom break. Always happens!!! Needless to say I was in and out and back out on the course without losing any time. I was keeping my goal pace of 8:30/Mile all the way through Windsor. Around mile 7 we headed out of Windsor and into the Detroit-Windsor Tunnel. I think this is where my race went downhill, literally. The tunnel headed downward and I didn’t pay attention and picked my pace up well under the 7:00 min mark. The tunnel was very HOT and very HUMID without much air circulation. I tried to slow down, but felt the calve muscles taking a beating and that uphill climb around mile 8.5 was tough. Lone behold I kept pushing and got back on pace, but to no avail it was a struggle for the remainder of the race. Coming out of the tunnel runners were met with crowd support that reminded me of the parade after the Red Wings won their last Stanley Cup!!! That was just awesome!!! Talk about a brief uplift of energy! After we headed out of the city into Corktown staying focused was difficult. I continued on to the next mile marker I was looking forward to, 11. My sister, who is an accomplished marathon and ultra runner was waiting with oranges for me there. I came running into Mile 11, where she said I was doing great and I went on my way. Always feels good to know people are waiting to cheer you on, even if it is for a few minutes. Runners headed back into the city where half marathoners split off and marathoners headed back out of the city towards Indian Village and Belle Isle. I spent several of the next miles fighting calve cramps and being winded. Luckily for technology and FaceTime, my wife and daughter willed me to fight and continue on. I can’t thank those two enough for pushing me along. At this point from miles 14-18 my pace had dropped down to around 13mins. It was a steady dose of running 3/4 of a mile waking 1/4 of a mile intermingled with stretching. Indian Village was filled with spectators passing out adult beverages, bands playing music and the numerous high fives! Aid stations were key to my survival and it was great to see the various Wayne State University athletic teams volunteering! Well done from my alma mater. At this point of the race runners were faced with drastic weather changes from humidity, to sunshine and WIND! The wind during the race made me know what it’s like to try and run with a 30lb weight tied to your back. Little did I know the wind and weather would get worse on Belle Isle. For those of you that don’t know, Belle Isle is an island that sits out on the Detroit River. We crossed the bridge at mile 20ish and that is when the rain started. This was an area where there wasn’t much crowd support outside of the aid stations. It was scenic and took me back to my college days. Thankfully I persevered and made it off the Isle where I passed BibRave pro Angie entering. The home stretch was in sight and winding back and forth along the Riverwalk. Around mile 24 several motorized bikes came up from my rear saying move to the right. At this point I was like what the heck, but forgot that the US only half marathon started at 10am. So while I was struggling I had runners go flying right by me. At this point seeing the city was all I was hoping for. With my daughter in hand and on FaceTime, she pushed me to run it the remainder of the way. Emotions were were draining, the calves were hurting, but talking to my daughter let me see how excited she was. I raised my arms and crossed the finish line under the 5 hour mark. Definitely not my best time and probably won’t be the worse. The Detroit Free Press Marathon humbled me. It made me work. It made me proud I finished!!! "Run Akron and Enjoy Beer Tasting - 8k"
This was my first time running the National Interstate 8k Akron Marathon race installment. I was a last minute entry and felt that the communication provided by Race Management leading up to the event was fantastic. I have run in other races from the Akron Marathon race series so the emails leading up, ultimately had me registering. The event hosts two different race lengths being the 8k & 1 mile race, which is run in downtown Akron, OH on the campus of Akron University. The start is just outside the InfoCision Stadium, with the finish being on the 50 yard line. The post race party was fabulous and provided various local breweries and root beer. The 8k was a new distance for me and would definitely recommend this race to those in the future. Expo: There is no expo for this event. Packet pick-up is offered all day the day before the race and once again beginning at 7am on race day. Swag: Included with your race entry you receive a race t-shirt, pint glass and medal for completing the race. The medal itself can serve as a bottle opener. In addition to your entry you receive three drink tickets to enjoy at the post race party, a banana and Chick-fil-a sandwich! SCORE! Aid Stations: There were two aid stations on the course and to be honest I didn't even realize them. With the distance being only 5 miles, I ran right past them. Course Scenery: The typical scenery one can expect when running through the city. I have run this route in other races so I was familiar with what to expect. Not much crowd support out on the course, but for those out there it was appreciated. Elevation Difficulty: The overall elevation gain over 5 miles was 220 ft. I definitely did not expect that and overall my performance was affected as I started out and race this way too fast. The hills that were on the course were gradually climbing. Parking/Access: Free, close parking is always a win! Race Management: Exceptional and what I have learned to expect from the Akron Race Series group. Knew exactly where to be and when. The announcements pre race could be heard across the venue.